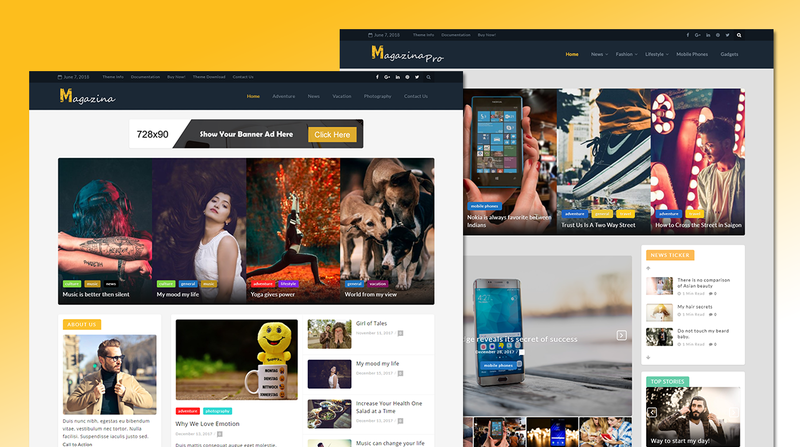 Magazina is a powerful theme made for Magazine, Newspaper and editorial sites. This theme comes with widget based magazine templates and has 12 post styles with drag & drop functionality and breaking news slider. The theme contains amazing features like One click demo import, live customizer, Typography with 250+ Google fonts, Top header, Styling options for each element, Category background color, Post pagination, Unique post option, Read post time, Social icons, Custom widgets (like: Ad widget, Social media, Post tab, News ticker widget and Recent post with thumbnail), Sidebar alignment ( right & left ). The theme is well documented. Sticky Sidebar- This option will help to stick your sidebar widgets. By enabling this option whenever you scroll the site, sidebar widgets will be stuck on the screen and stop floating with the site. Post read Time- Display the reading time required for any particular post. It estimates the time required by the reader for reading a whole post. Post style 2- Use this post style to show post slider with specific category. You can place this post style in sidebar too. Pick color for each element. Post style 3- Use this post style to show post in left column along with description and other post images in right column. Pick color for each element. Choose specific category for both. Post style 4 - Use this post style to show post in left column along with description and color for each element. Choose specific category or random post. Post style 5 - Use this post style to show post in left column & right column along with description and color for each element. Choose specific category or random post. Post style 6- Use this post style to show post in column and color for each element . Choose recent post, random post or popular post. Post style 7- Use this post style to show post in left, right and center column along with description and color for each element. Choose recent post, random post or popular post. Post style 8- Use this post style to show random post in a full-width slider and thumbnail image of post. Pick color for each element. Choose specific category. Post style 9- Use this post style to show post in list format. Choose category or display random post with color for each element. Post style 10 - Use this post style to show post with description on the image and other post with thumbnail images. Choose category or display random post, recent or popular post with color for each element. You can also hide the big post. Post style 11- Use this post style to show post in grid layout with image and description. Choose category or display random post, recent or popular post with color for each element. Post style 12- Use this post style to show post with thumbnail images and description. Choose category or display random post, recent or popular post with color for each element. Sidebar Post Widget- Use this widget in sidebar or footer to show post with description. Choose category or random post. About Us Widget - Best suitable for sidebar. Use this post style and display author bio along with description and social profile icon links. Typography - Make your site more attractive and professional by using global typography. More than 250+ Google and standard fonts with font families and style. Theme Color Option- Choose desired theme color and highlight your button, selected text background color, hover link color etc. Multiple Color Option- Make your site more colorful by picking refreshing color for each element. You're free to use any desired color. Category Color Option- Pick desired color for each category background. Make site more rich and colorful. Sidebar Alignment- Make sidebar alignment easier. Use this feature to display sidebar right or left aligned with your post. Header layout- Top Header - You can show custom menu with present date and social icon on the top of your site. You can also display logo, site title, tagline in your header. Ad Widget- Display Ad on your site. You can show desired Banner image of size 728x90 or Google Ad by just generating the Google Adsense Code. Social Icon Widget- Add your Social profile and increase your connectivity. Use this widget and add social profile links on your website. Recent Post Widget- Best suitable to show your recent post along with description and thumbnail image in sidebar and footer. Breaking News Slider- Show your breaking news in moving slides. Just choose the desired category and number of post to show. Pick color for each element. Copyright Editor- Change the copyright text with color. No white label limitation on it. Site loader- It will show a pre-loader on the screen until the site loading is not done. You can enable or disable the site loader. You can also pick desired color for it. News ticker Widget- It will show your post in vertical navigation slider. Just choose the category, and show your latest post news along with featured post image or without image. Best suited for sidebar area. Post Pagination- Load more post on your site. It will help you in navigating to new post in post layout. Post Tab Widget- This widget will show your recent post, popular post and comment. Just add the number of post/comment along with the length of post excerpt length. Best suited for sidebar area.